Buy Denny Cove here and save money versus purchasing from within our app via Apple or Google. It’s exactly the same guidebook, but offered at a lower price on rakkup.com. Denny Cove — a new crag to the Chattanooga area offering 154 (and counting) sport and trad routes. The rakkup Denny Cove guide is currently the exclusive guide to this brand new area. Chatt Steel edition II (due out 2017) will debut Denny Cove in print, along with several other new areas to the Chattanooga region. 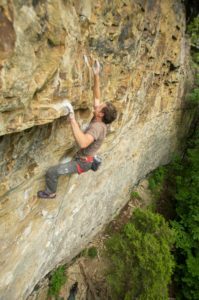 Denny Cove is located down the street from Foster Falls and up the mountain from Castle Rock — putting it squarely in one of the most popular areas to rock climb in the South Cumberland region. Jason Reynolds (park ranger at the nearby Foster Falls) established the first routes at the cliff in 2011 and would later tell Steven Farmer and Cody Averbeck about the area. These two walked the cliff and were blown away by the variety of the different walls. Dubbing it a ‘Sandstone Buffet,’ the two recruited a core group of developers including John Dorough, Dave Wilson, Edward Yates, and Anthony Meeks. Over the next several years, the group would spend most weekends at the cliff knocking choss off of the buffet wall and making fun of each other. Like Foster Falls, Denny Cove has a wall for everybody. Be it slabs, faces, to bunkers, Denny has it. Of special interest is the Buffet Wall which can really only be compared to the Lizard Wall in Little River Canyon, AL. Like Lizard Wall, the buffet wall is one of the driest walls in the region during wet weather. More importantly, the wall has a one of a kind climbing personality that blends limestone side pulling down low with classic pumpy Sandstone edges up high. This wall has nearly 50 5.12s with routes up to 100′ long — and is not to be missed! In all, Denny Cove is a huge and highly valued addition to the Chattanooga climbing portfolio. It also represents a watershed acquisition project spearheaded by the Southeastern Climbers Coalition and the Access Fund. 10% of sales from this guidebook on rakkup will go the SCC to help preserve climbing access at Denny Cove. Learn more about Cody’s guidebook company Rockery Press here.